I love this braid because it looks complicated; the secret though is that it’s actually a waterfall and french braid thrown together. I’ve created a few different styles with this combination and always fall for how cool it looks in the end. Since prom is right around the corner, I’ve had a few requests for fancier updos that are perfect for a dance and decided to spice up this style with a little clip on one side. If it doesn’t seem too tricky, I hope you will give it a try and let me know what you think! Be sure to tag me on instagram so I can see your version of the look! Step 1 / Separate out a section of hair from the part to the left ear and clip off the back section. Step 2 / Divide the front section into two halves and pin off the front portion. Step 3 / Create a waterfall braid and tie off the braid with a hair elastic. 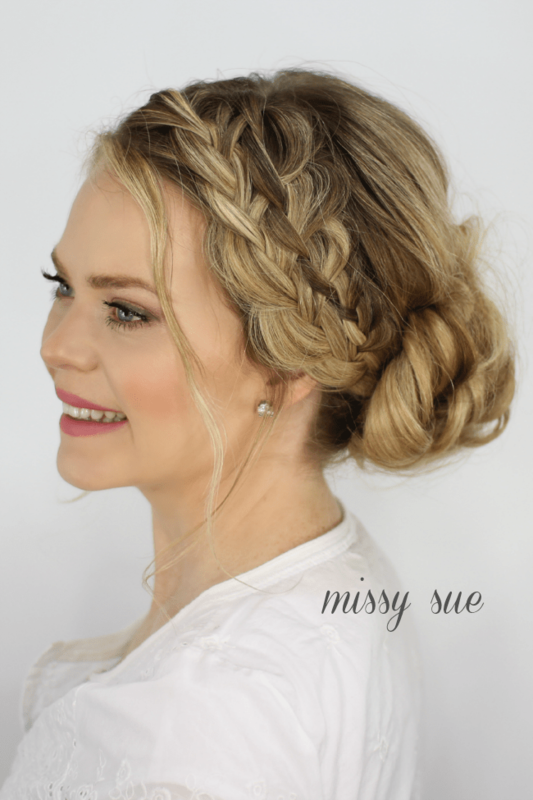 Step 4 / With the front section create a french braid and pull in the waterfall strands to create a combined braid. Step 5 / Sweep all the hair into a low ponytail. Step 6 / Wrap a hair band around the hair and on the last wrap only pull the hair halfway through. Step 7 / Pull the top of the loop up against the head and pin it in place. Step 8 / Take the hair that is hanging down at the bottom and wrap it around the left side of the bun, pinning it in place. Step 9 / Pin up any strands that are hanging loose. Step 10 / Spray the style with hairspray and add a pretty clip. Genius! And so well explained! Thanks for sharing and I can’t wait to try it ! Your video is perfectly shown! This updo is gorgeous. I’m going to try it.